Delaware Christian’s Lyssi Snouffer, center, shoots during the first half of Thursday’s MOCAL showdown against visiting Tree of Life. Two of Central Ohio’s leading scorers met in Delaware Thursday night and did not disappoint. 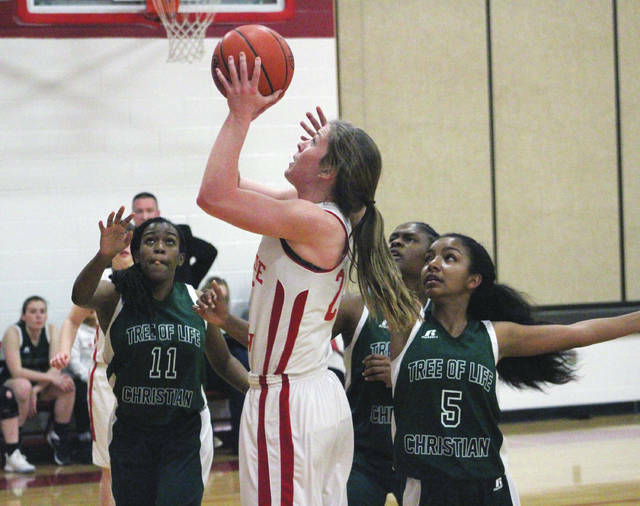 Lyssi Snouffer poured in a game-high 41 points and pulled down an astonishing 37 rebounds to lead host Delaware Christian past Tree of Life 72-59 in MOCAL action. Snouffer, who averaged 22.8 points and 17.9 rebounds per game coming in, far exceeded those marks in the victory. Snouffer at times looked like a wide receiver reaching up with one hand – which is like a suction cup. If she touches it, she will catch it. And she got a lot of help from Abbi Maurer, who scored 21 points, pulled down 18 rebounds and dished out seven assists as well. Tree of Life got 34 points from its top scorer Mallory Garbe, who averaged 19.1 per game coming in. She scored all of her team’s 15 points in the third quarter. Garbe scored the first four in a 6-0 start for the Trojans. But, DCS closed the quarter 18-4 to take the lead, led by 10 points from Snouffer. An Anna Fuller basket gave the Eagles the lead for good at 10-8 midway through the frame. The Eagles (8-7, 3-4) led by as many as 13 in the first half before Tree of Life closed the half 8-2 and trailed 39-32. Garbe scored the first four points in the first minute of the second half and DCS turned it over on its first two possessions as the Trojans closed to 39-36. Snouffer answered with a pair of free throws and a basket and Maurer added another bucket to push the lead back out to nine. Snouffer scored the final seven points of a 9-0 run, which included her first career three-pointer to push it to 63-47 early in the fourth – the Eagles’ largest lead of the game. The Trojans went 12-3 to cut the deficit to 66-59 late, but DCS finished with a 6-0 spurt to close out the scoring. Snouffer also finished with four steals for the Eagles, and Nikki Sneddon pulled down eight rebounds. Rakeap Mewael added 12 points for the Trojans (6-7, 4-4). Next up, DCS heads to Lancaster to take on William V. Fisher Catholic in non-league action Tuesday night at 7:30 p.m.
https://www.delgazette.com/wp-content/uploads/sites/40/2018/01/web1_snouffer-1.jpgDelaware Christian’s Lyssi Snouffer, center, shoots during the first half of Thursday’s MOCAL showdown against visiting Tree of Life.